Here I am highlighting one glaring incident that had taken place due to not doing centering and shuttering work properly and causing extensive damage not only to the work but to the life of people involved. All this happened due to the ignorance, negligence and a desire to save some money by using less shuttering material for vertical supports. This episode is being cited to caution the contractor ,carpenter doing work, owner of the building and architect responsible for supervision. Some where in December 2006 a huge work for laying reinforced cement concrete in beams and slab was under construction for a factory near Delhi . This work was private work and the owner of factory was doing construction through labour contractor . The owner was ignorant and did not know the method and safety precautions to be taken during centering and shuttering work which was done before laying cement concrete for beams and slab . It was not clearly known that someone architect or any civil engineer for supervision was employed for the job or not. The blame come to the contractor who did not arrange proper vertical support and the shuttering carpenter who was unskilled and have no experience about the work at the height 18’ from ground level . It is certain that nature does not spare anyone if things are not done properly. It doesn’t matter if the person committing the fault is ignorant or negligent nor does it matter about the honestly, integrity and knowledge of the people involved. After completing shuttering work , the black smith completed the bar binding work for beam and slab. The contractor started the work of laying cement concrete beams and slab for the roof of factory shed with arrangement of adequate mechanical mixture, vibrators , labour, mason, shuttering carpenter and with necessary raw materials .After 2 or 3 hours of work the vertical supports under the shuttering fell down at one point and that lead to the collapse of the whole structure. The accident proved fatal for some and many others got injured . The month in which work was done was mid December and darkness spread all around in early hours and there was no proper arrangement of light. Most of the labors had left the site and were not available for the rescue work. When information reached in district headquarter then the department arranged the J.C.B. machine to remove mulba / collapsed material from the site so that people trapped under the shuttering material could be saved . That evening all efforts to remove collapsed material failed as M.S steel bars which were binding in beams slabs and had jointed with each other from one end to other end in both direction could not be separated by the J.C.B. machine. The cement concrete laid before 6 to 8 hours started becoming hard and the shuttering material below M.S steel also created problems. The rescue work continued the next morning with the help of J.C.B. machine, more labour and gas cutter used this time. The steel bars were cut with gas cutter. But the carpenter under the shuttering material could not be saved. The roof slab of the factory shed was about 18 feet high from ground level and the labour contractor and shuttering carpenter did some mistake either knowingly to save money or due to ignorance . 1. While doing shuttering for slab or beams they used wooden ballies of height 10 to 12 feet long for vertical support. 2. Far attaining the height of 18 feet they had used 2 to 3 feet high dry brick pillar below the ballies and then they placed the wooden plank of 3 feet long on the top.of the first set of ballies and then they used another balli piece of 3 to 4 feet height on the wooden plank to attain the required height of 18 feet. 3. Then they fixed the wooden batten on top of the second set of ballies. 4. The ply wooden sheet was then placed on top of the batten. After bending, binding of M.S steel bars the laying process of cement concrete started and vertically supports fell down and the whole shuttering structure collapsed one after the other. What precautions should have been taken while doing centering and shuttering? The episode happened for not taking precautions and safety measure during centering and shuttering . 1. The centering and shuttering for height more than 15 feet should be done with kribs. 2. If kribs are not available than iron pipes with adjustable height can be used as vertical supports with wide base at bottom and top. 3. 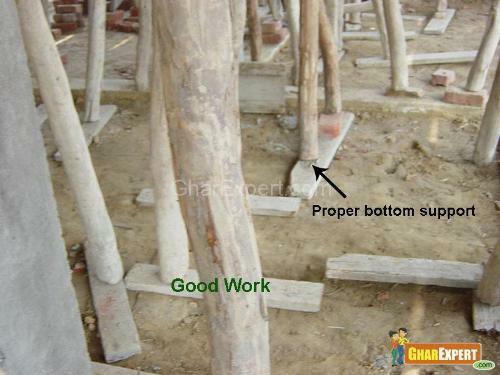 If one want to do the shuttering work with wooden ballies then the shuttering should be done in two stages . 4. 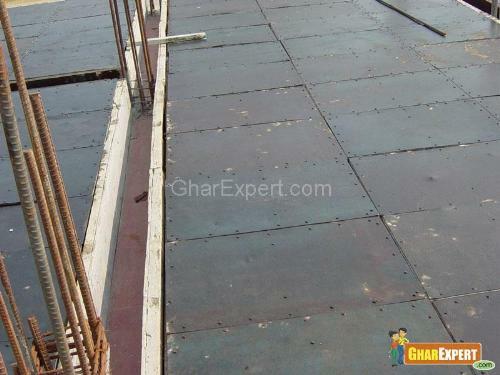 In this type of shuttering one stage is done with the wooden ballies about 10 feet high and wooden planks should be laid by covering at list 50 to 60 % area of the shuttering. 5. Second stage shuttering is done by giving load on first stage shuttering. 6. Cross bands with bamboos and ballies with vertical supports should be made in both stages . 7. 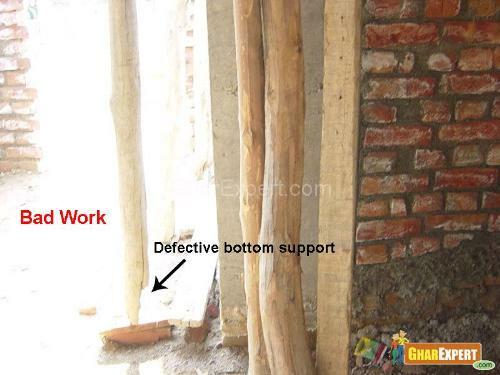 Avoid dry brick pillar under the vertical supports . 8. Before starting cement concerrte laying process, temporary path with planks or bamboo zali should be made for walking of labour while placing cement concrete at required spot. This will help in keeping M.S. steel bars in proper position . 9. Never allow labours to throw cement concrete pans on the shuttering at the time of laying but the cement concrete should be laid gently with the help of peskar . 10. One shuttring carpenter with helper must be deputed with some ballies of proper height under shuttering where work in progress . These type of incidents happen at many places in private and govt. work but the scale of damage in the incident mentioned above was very high. The incident happened due to ignorance of importance and procedure of shuttering as. 1. 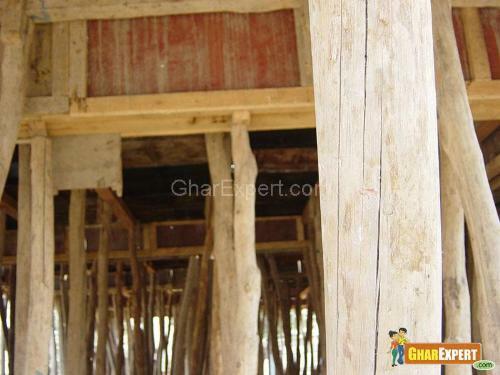 Shuttering was done without proper material. 2. Shuttering was done by employing unskilled , unexperienced shuttering carpenter who did not know the job well. Hi are using WordPress for your site platform? I?m new to the blog world but I?m trying to get started and set up my own. Do you require any html coding knowledge to make your own blog? Any help would be really appreciated! Good information to share and thanks to Gupta ji, i am also now planning to go for house Roof-Shuntring on Next Week (26-11-10) construction. this information is practical and valuable.Because read this artical I am affried Because my Shuntring Person is not proper fully trained & not Proper full stock shuntring material. of this website developers. thanks. I'm extremely sorry to give you thanks. Thank you. yes really good information to share and thanks to Gupta ji, i am also now planning to go for house construction. this information is practical and valuable. One of the fastest growing trends in the flooring, tiles come in a wide variety of styles, patterns and colors.